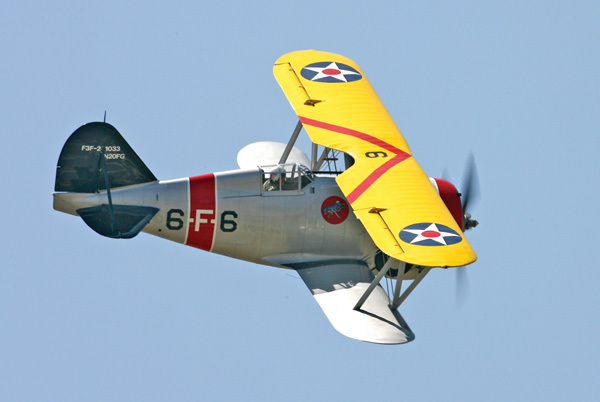 The F3F marked the end of the era of the carrier-based biplane fighter. F3F-2 fighters at the Grumman factory, February 1938. In August 1935, the US navy placed a production order for fifty-four F3F-1s, with the first to be delivered in 1936 to Squadrons VF-5B (USS Ranger), and VF-6B (USS Saratoga), with whom they continued to serve until 1940. One XF3F-2 was followed by eighty-one production aircraft, making the F3F-2 was the most satisfactory single-place fighter developed for the US Navy to date. This model served with VF-6 (USS Enterprise) and with US Marine Corps Squadrons, VMF-1 and VMF-2. The final production model was the F3F-3, which was fitted with various propellers, split landing-flaps, modified cowling, and other devices intended to improve overall performance. Twenty-seven F3F-3s were delivered in 1938-39, which brought the overall production of F3F series aircraft to one hundred and sixty-four aircraft.7 Most of the F3F-3s went to VF-5 (USS Yorktown) or VF-7 (USS Wasp). A Grumman F3F-1 in flight with a Twin Wasp Junior R-1535 engine. Notice the difference in the cowling from the F3F-2 above. A scale model of the Grumman F3F-1 above. 200 lb (91 kg) bomb. 1. Enzo Angelucci and Peter Bowers. The American Fighter. (Sparkford, Nr. Yeovil Somerset: Haynes Publishing Group, 1987.) 220. 2. Lt. Cdr. Benton Reames, U.S.N. Aircraft In Profile, Volume 4. The Grumman F3F Series. (Surrey, England; Profile Publications Ltd., 1968.) 3. 3. Richard Thruelsen. The Grumman Story. (New York: Praeger Publishers, 1976.) 85. 4. Lt. Cdr. Benton Reames, U.S.N. 3. 5. Enzo Angelucci and Peter Bowers. 220. 6. Gordon Swanborough and Peter Bowers. United States Aircraft since 1911. (Annapolis, Maryland: Naval Institute Press, 1990.) 217. 7. Kenneth Munson. Fighters Between the Wars, 1919-39. (New York: The Macmillan Company, 1960.) 138. 6. Lt. Cdr. Benton Reames, U.S.N. 5. Created February 22, 2010. Updated October 18, 2013.